The other component of Google Play Music is the function of uploading music that you already own to your own personal cloud. This is done via the Music Manager. Google will try to match the songs and albums that you have with the music it has on its servers, and where it does not currently have matching music, it will upload the songs and albums. There is a song limit of 20 000 tracks, and songs purchased in the Google Play Music store do not count towards this limit. Google Play Music is an excellent and free way to back up your music, and to have it available to stream via your Android device or any computer connected to the web. What’s more, it offers the option to make playlists or even an Instant Mix, made up of a random selection of your music. 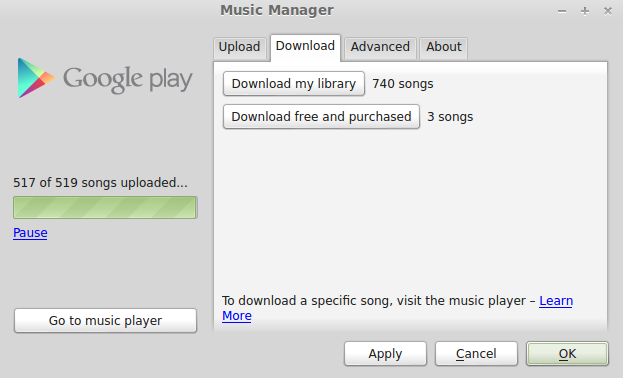 Among others, there’s a monthly subscription for online listening called « Google Play Music All Acess ». It costs £9.99/month and with that you can get lots of suggestions what to listen to, which can help Global Listeners a lot!